I don't know about Safari on IOS, but I've come to believe that the new Firefox for Android is the best mobile browser for Android. You can download it at the Google Play store. I never use the stock browser or Chrome with my tablets or phone. They claim to be fast, but honestly, I don't notice better speed with Firefox. I think the fastest browser in my experience is UC Browser, which I also don't use anymore. 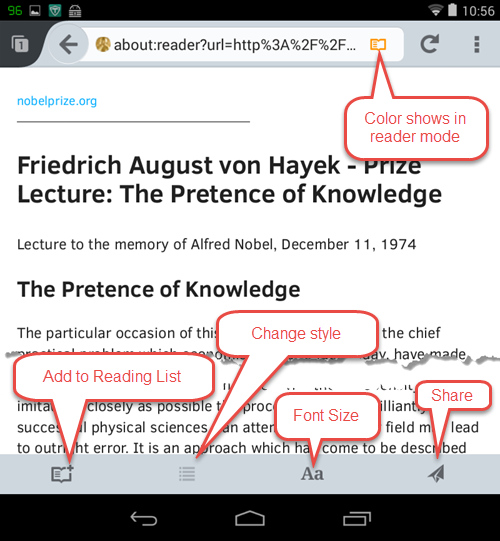 Here's why I prefer Firefox for Android. Better pinch and zoom. Firefox seems to be better at resizing and reformatting websites for the smaller phone or tablet displays. You can change search engines. Chrome for Android makes you stick with Google as your search engine and you can't change it. Firefox allows you to use any search engine you like. I like to use DuckDuckGo and preferred to have a browser that let me use it. I've written about DuckDuckGo, including how to make it the default with Android here. Better tab management. I find it easier to use multiple tabs and switch between them with Firefox. Quick access to most used, bookmarks, reading list, and history. Reader Mode. This is something new and it is fabulous. This alone would make me switch. As you look at some web pages, there are sometimes articles surrounded by crap, which slows it down and makes it hard to read. If Firefox can extract the article from the crap, it puts a book icon up in the address bar. If you see that, you can click on it and enter Reader Mode. This is only available on the Android version. They don't have it for Windows yet. That little open book icon shows you can do reader mode with this page. Tapping it will change icon color and the page, putting you in a ebook reader like environment. The bottom row of buttons allows you to add the page to your reading list, Change from daytime to nighttime theme, change font size, or share the article. Once you are back to the Firefox new tab page, one of your options is to choose Reading List. Then this page, cleanly formatted will reappear. Mozilla has a good article explaining this feature here.